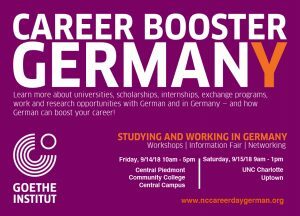 Every year the German Language and Culture Foundation is awarding around $100,000 to students in the Carolinas to go and study abroad in Germany, Austria, and Switzerland. This year the foundation was able to send more than 40 students on the adventure and is approaching $1,000,000 in scholarships given since 2007! Please join me in celebrating this great accomplishment with our scholarship recipients, great sponsors, and German professors. We are also very excited to announce that former CPCC president, Dr. Tony Zeiss, will be this year’s key note speaker. 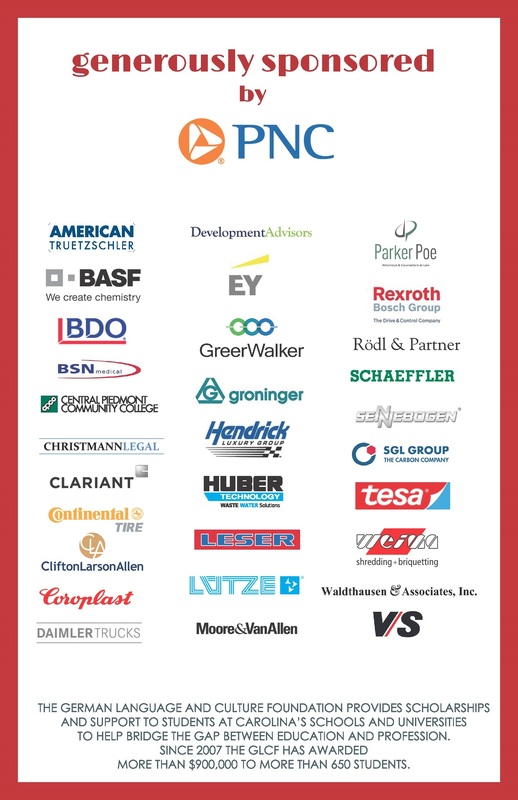 During Dr. Zeiss’ presidency CPCC has continuously extended its partnerships with Germany and regional businesses from German-speaking Europe. He initiated and supported programs like Apprenticeship 200 and Apprenticeship Charlotte as well as the cooperation with the IHK Karlsruhe. 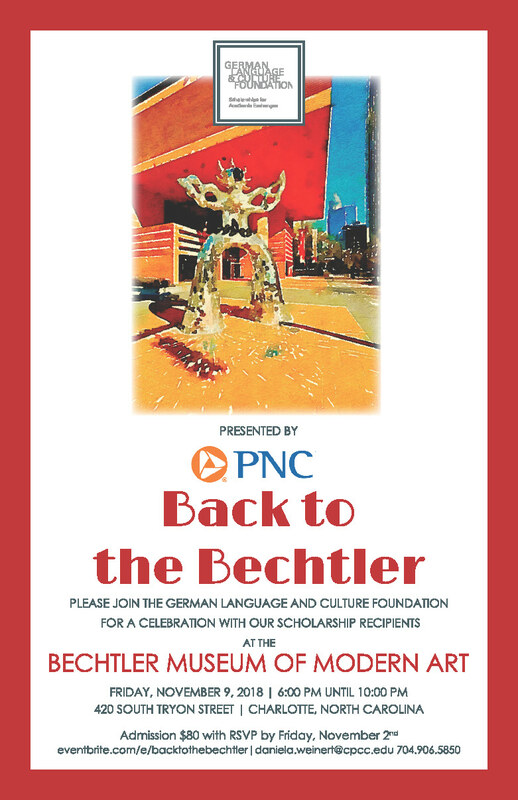 This year’s celebration will take place at the Bechtler Museum of Modern Arts at the Levine Center for Arts, 420 South Tryon Street on November 9th from 6:00 – 10:00pm. Parking is possible at the Levine Center for Arts, entrance West Stonewall Street. The invitation for the event is now live on Eventbrite. The tickets include admission, German buffet, wine and OMB beer, and good company. Tickets range from $ 40 for instructors and students, and $ 80 for anyone else. Please kindly RSVP by November 2nd. I am very much looking forward to seeing you there and to celebrate with you! Please let me know if you have any questions.